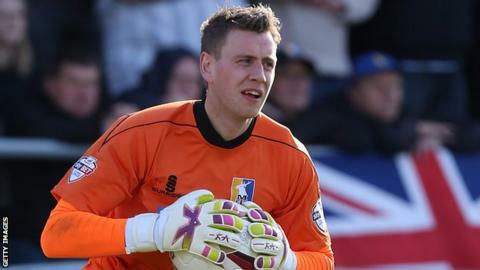 Veteran goalkeeper Alan Marriott is one of six Mansfield Town players to have been offered a new contract. The 36-year-old is considering new terms, as are midfielders Colin Daniel, Anthony Howell, Jack Thomas and Lindon Meikle and defender Liam Marsden. But the club have released 10 players, including striker Ben Hutchinson. George Pilkington, Keiran Murtagh, Paul Black, James Jennings, Godfrey Poku, Ian Deakin, Ross Dyer, Jake Speight and Lee Stevenson have also been let go. Meanwhile, the club have activated one-year contract extensions in the deals of midfielder Chris Clements, 24, defender Ritchie Sutton, 28, and 29-year-old forward Matt Rhead. Hutchinson, 26, has missed much of this season through injury, while defender Pilkington, 32, and midfielders Murtagh, 25, and Poku, 23, spent much of this season out on loan.